Our 4 Zone Touchscreen Time Clock is perfect for those looking to control multiple outputs from a single control point. The TM4 has been designed to work on with our UH8 and DS-SB Setback Thermostat, and offers a highly effective, simple to use control system. The Touchscreen interface makes programming switching times in the TM4 simple, and means you no longer need to reach for the user manual when you need to amend the programmed setting. The TM4 offers control of 4 zones, each zone with their own individual time settings. All time clock models can be used to control anything – not just your heating system. This programmable function allows you to extend the program time in 30 minute increments – ideal for unscheduled operation of the system. 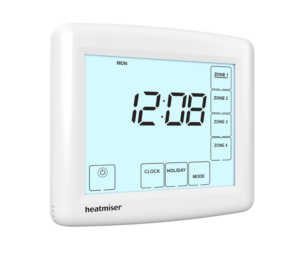 4 On/Off times are provided on all time clock models, allowing flexible control of your heating system.